Ansonia Clock Co. "Crystal Regulator No. 6", ca 1906. The last in the 6 set series of crystal regulators made with Royal Bonn Porcelain tops and bases. If you have never seen a complete set in the beautiful rich colors used by Ansonia, you have missed a treat. 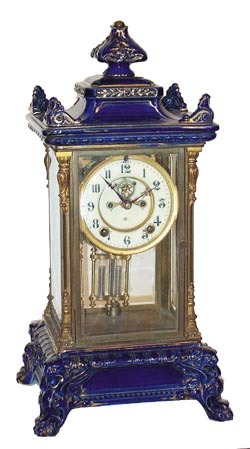 This clock is Cobalt Blue with plentyof gold accent. 8 day movement striking half hours on a standing Cathedral gong, and is running nicely. French sash, 2 piece porcelain dial, visible escapement, and correct hands and pendulum. All 4 glasses are beveled and perfect. The clock runs fine but should be serviced if you plan to addit to your collection. If you prefer original this is it, if you like thembright you will need to clean the polished brass and rich gold ornaments asthey probably have never been cleaned. This model is 17-1/2 inches high. Ly Ansonia, page 137.